Kenny, Mayisa, and Adib were the top three individual competitors. Adib answered 17 of 18 questions correctly in the individual round! On Saturday, 60 middle schoolers and their coaches joined BEAM for the second ever BEAM Los Angeles Math Competition. Of these, fully half (30 students!) attended BEAM 6 last summer. The competition featured an Individual Round and a Team Round along with time to share solutions and an awards ceremony. Awards were given to the top three individuals, the top three teams, and the top school overall (based on how their multiple teams did). What is the biggest number which can be evenly divided by 12 with no remainder that you can make by using each of the digits 0, 1, 2, 3, 4, 5, 6, 7, 8, and 9 at most once? We’d like to thank 9 Dots who generously donated the space for the competition; thanks so much! Thanks also to all the students and staff of Alliance Richard Merkin Middle School, Berendo Middle School, Clinton Middle School, Equitas Academy #2, Girls Academic Leadership Academy (GALA), Rise Kohyang Middle School, Synergy Kinetic Academy, UCLA Community School, and Virgil Middle School who joined us on Saturday! We hope you had as much fun as the BEAM staff did in organizing this event. Missed out? Here are some of our favorite images from the event! GALA students work on the individual round. Virgil students during the team round. A student from Equitas Academy #2 dons his Mathletes shirt while working on the individual round questions. A group of students from Clinton Middle School discuss one of the team round problems. A group of students from Synergy Kinetic Academy discusses individual round problems. A student from Equitas Academy #2 is excited about an answer during a presentation of solutions to the team round questions. The best overall school performance went to the students of Virgil Middle School. 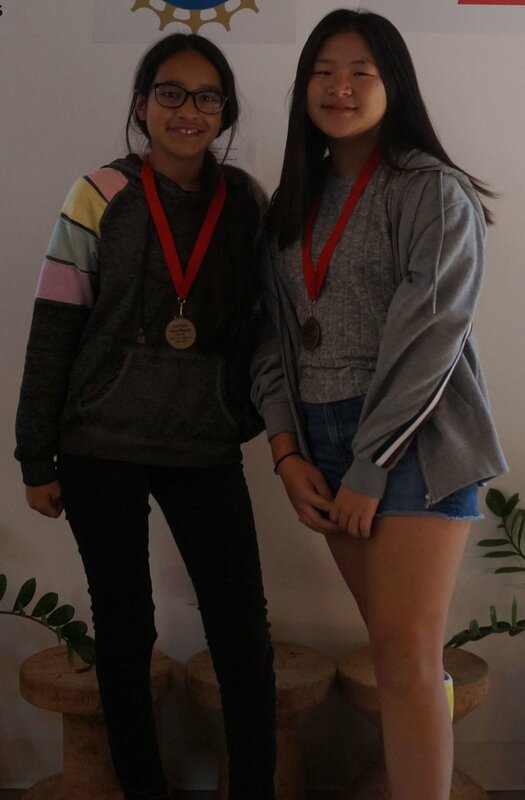 Kaylee and Sharon, BEAM 6 alum, won 3rd place in the team round representing Rise Kohyang Middle School. From left to right, Jipper, Abraham, Joshua, and Cherokee, won second place in the team round representing UCLA Community School. Abraham and Cherokee are BEAM alum. From left to right, Adib, Mayisa, M.K. Luis, and Kevin won first place in the team round representing Virgil Middle School. 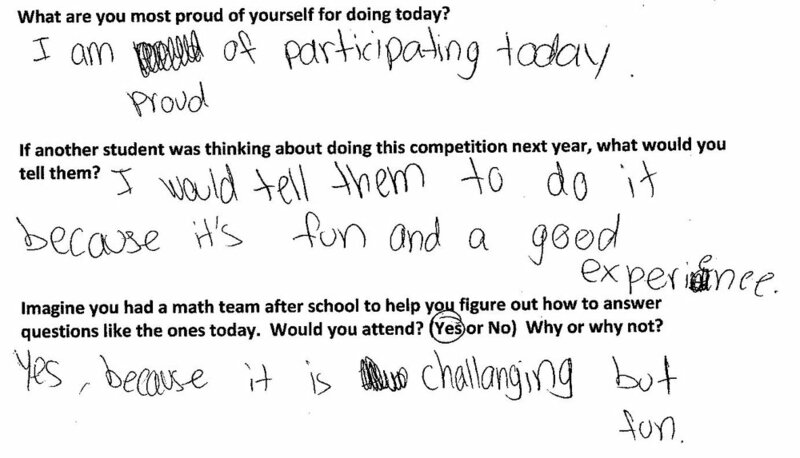 Last year, BEAM held one math competition for 37 students. This year, we will be holding two and we can’t wait to see how many students show up for our spring competition! See you then! The AMC 8 is a 25 question contest, and it's quite challenging. This year, 149,277 students nationwide took the contest. The median (middle) student scored 8 -- less than a third of the questions answered correctly! To score in the top 25% percentile, students had to score at least 11. Only 90 students across the world got a perfect score. Of the 12 students who took the contest, 9 scored above 8 questions correct, putting them above the nationwide average. Good work, everyone! We are particularly impressed by Ahmed, whose score of 13 puts him the top quartile nationwide. BEAM is sure this a sign of future success yet to come. Every Thursday and one weekend a month, BEAM hosts "Office Hours". Just as in college, students can bring anything they're working on and receive help or advice from staff and volunteers. Students also had time to take a break and eat a snack with friends. By the time BEAM students get to college, they will be in the habit of seeking out help as needed!